Last Monday I needed to do a long run in preparation for my half marathon on Sunday. I didn’t want to run at all (as is almost always the case) but I also didn’t want to show up Sunday as totally unprepared as I’ve gotten used to being with these events. So I ran 9 miles. I intended for them to be slow miles but they weren’t all that slow. When I got home I thought it might be good to stand in my not heated swimming pool thinking it would be nice and cold and that it would help my legs recover. Sadly there were 2 things wrong. First of all, it was not cold. It’s the end of July and it’s been hot and the water was probably 75 degrees. Second of all there were unwelcomed interlopers in the pool. EW! Having 2 large spiders on my pool floor could only mean that there is a whole population of them nearby – like in my house. That coupled with my son finding a large black widow in his formerly filthy (now clean as a whistle) bedroom a couple weeks ago is just about enough for me to get the place tented. Only thing is – we can’t win against our 6 and 8 legged friends. If you don’t believe me just rent The Hellstrom Chronicle and you’ll know. Bugs will rule the world some day – mark my word. I brushed the little creeps down to the filter and went in the house for a recovery drink. It was all I could do. And I’m not just talking about recovery from my run. On a lighter note – did you see that shot of the dog in the polka-dotted hat along the Tour de France, today? Too adorable. And how about that Casar? If ever anyone deserved to win a leg of the Tour it was him with his poor battered and bloodied hiney – ow! The person who owns the dog that caused that accident should be in jail right about now. But poor Axel Merckx *sniff sniff* Mais, c’est la vie, non? Bugs in the pool. Ew! you can’t tell me NOT to read your blog and expect me to follow your instructions… but, you already knew that, didn’t you? TRAITOR!!!!!! i hope that your recovery drink was a shot of tequila… that’s what mine would have been after THAT. That is too weird! 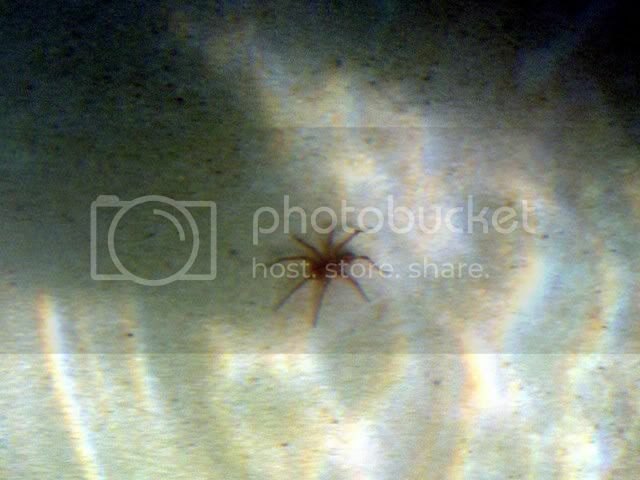 I have seen tons of spiders that float on the surface of the water, but never scuba spiders! Did you find out what kind they are? As long as they don’t bite, I like spiders-especially Tarantulas. I save them from the middle of roads. Snakes too. 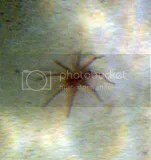 I had that same experience the other day in the pool at the gym – I was like, do NOT Touch the floor of the pool with my feet…and then I kinda swished the water near the spider with my feet out of curiousity – which was when I learned that apparently when they drown, they drown standing up. I guess they’re balanced that way. ah, they are not too bad, if i’d been there i would have killed ’em for you, mom! 🙂 well, maybe not the black widow – i do have my limits. I love Fe-Lady!!! Saving spiders from the middle of the road… how can you not love that???? Spiders are welcome to stay outside my house…. How’d you do on Sunday? Perfect weather for me, so I finally hit my imaginary threshold and PR’d. i used to own 3 tarantulas. spiders remind me of Star Wars beasts. what i don’t like in the pool are june bugs. they’re always where your head is when you come up. ew!